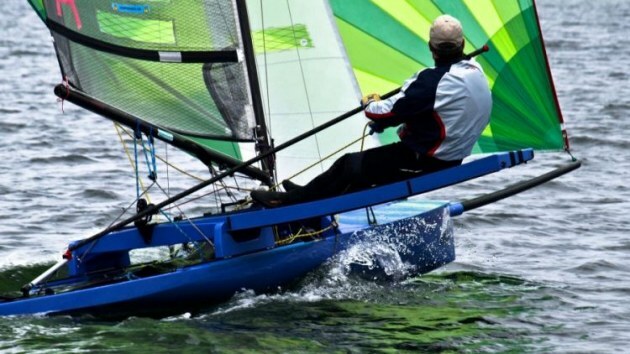 Loch Lomond SC is the successor in kind and premises to the Clyde Canoe Club. With the class having long abandoned the Royal Canoe Club at Twickenham I suspect that makes LLSC the longest established sailing canoe racing organisation in the country. For the first time for a few years ICs outnumbered ACs, by quite a margin in fact, and the majority of ICs were post 2005 rules boats in appreciable variety. The only significant designer missing was Chris Maas I think.. Even amongst the older boats there's a Slurp or two and a highly modified Nethercott, so there are only a handful of true One design ICs. This was the first time for many years � certainly beyond the memory of all current active sailors - that such a varied choice of hull shapes wwere on offer. Sponsored by Tunnocks (chocolate mallow tea cakes and wafer biscuits)and Glengoyne (whisky), the nutritional requirements of the competitors were well catered for! We started � or rather didn't start � with an hour's postponement waiting for the wind. Forecast rain pretty much held off. 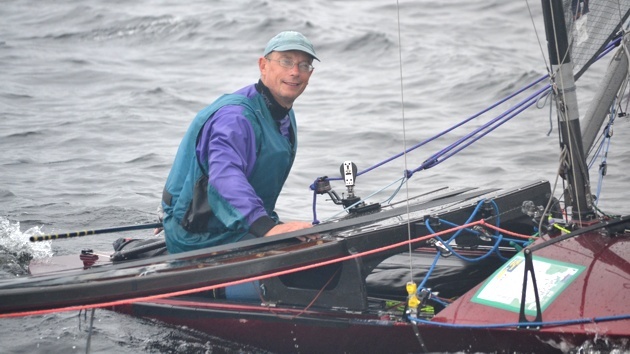 Alistair Warren was kitted out in his raven black sailing kit and sent onto the course to look for wind, tide and sunshine. In true biblical style, he didn't return and so the 34 strong fleet ventured forth.and encountered a reasonable enough racing breeze, though not enough to take the boat away from the light airs settings. Those of us who are not used to having our lakes surrounded by billion ton lumps of rock looked up wind trying to wonder what these hills and mountains were going to do to a light vaguely easterly breeze. The answers seemed to be "lots" and "nothing predictable". The first failure to predict occurred at about 90 seconds before the IC start, when a sudden and unexpected lull � first of the day - marooned various unwary competitors some way from the start line. The victims even included this reservoir sailor who really should know better. A complex race ensued, with much wind variation and as a result plenty of overtaking opportunities and consequent place changes. Colin Brown (IC) and Robin Wood (AC) led the respective fleets home. Well, for day two we had the long distance race. This started with a beat up the side of the island of Inchfad � which I'm told translates as Long Island and between Inchfad and Inchcruin, a passage which locals told us, with perhaps unnecessary relish, they call Hell's Gate due to the presence of a long reef which blocks about half the channel, with a narrow but well marked passage to starboard and a broader but less well marked passage to port. To windward of the passage was laid a windward mark which was rounded to port, followed by a spectacular high speed reach to the Island of Creinch, leaving that to starboard. This meant a beat round the back and another high speed reach back to the *same* windward mark, this time to be left to starboard. From there was a long downwind leg round the other side of Inchfad, emerging between it and Inchcailloch, with the course tightening up into a long too shy for AC kites reach to a leeward mark off the club. From there a second lap took us up through the gate of hell back to the windward mark, leaving it to port this time, and then running straight back down the far side of Inchfad, round the leeward mark and back up to the finish. 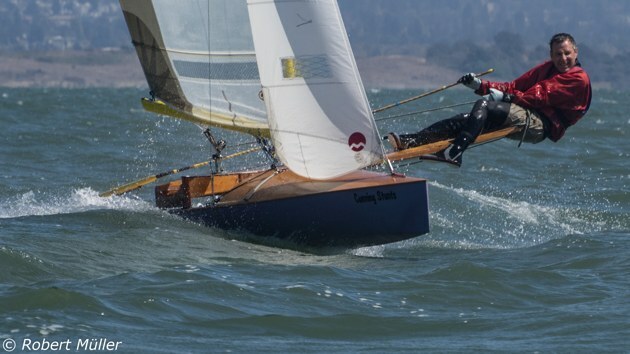 The three miles first beat started in a pleasant force 3, but Hell's Gate lived up to its name and, by the time the boats were reaching the first mark, a steady force 5 was blowing. Loads of white horses and plenty of drama. It was no race for the faint hearted, and a couple of us fainthearts � or at least less healthy or with less well tried boats � bailed out at various stages. Alistair Warren led the fleet down the first reach, followed in hot pursuit by Gareth Caldwell, Robin Wood and Steve 'Twisted' Bowen. Despite the strong winds, calm patches in the lee of some of the islands, and numerous wind shifts, the fleet coped admirably and positions remained fairly constant. 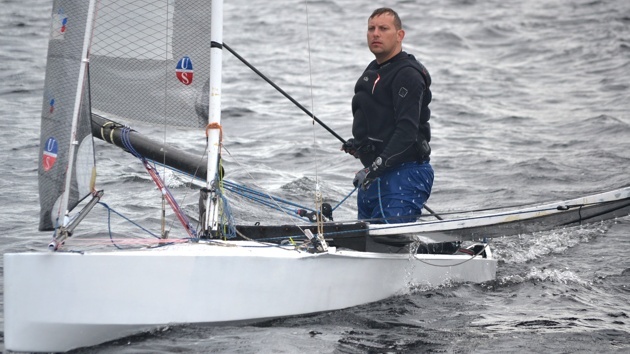 Back to the race - there seemed to be a hell of a scrap going on for the lead, and as they came down to the leeward mark for the second time after some 20 plus miles of racing Alistair Warren and Robin Wood were just feet apart in clouds of spray. Technically they were in different races, and racing each other just for pride, and on the last beat the pride of place went to Alistair who just crossed the line ahead. The plan was to get three races in to get the event back on schedule. We launched in what seemed to be a lightish breeze, but which turned into a splendid F3 once we were well out on the lake and nearing the start. The wind shifted somewhat and dropped a bit after lap one, but the RC set up a well executed course change and mark shift. Thus the ACs continuing to do windward leewards and everyone had a reasonably square beat that had changed direction enough for anything we had learned about which side to go on lap one to become worthless again! Colin Brown again showed a lean pair of heels to the rest of the IC fleet, with Gareth holding onto second place by half a boat length from Alistair. 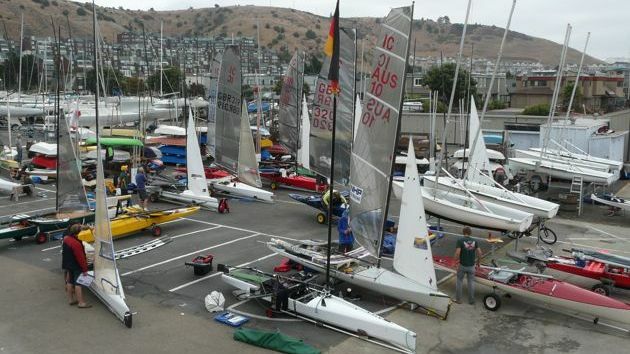 The AC fleet was again shown the way around the course by Robin Wood. Race Four, the second of the day, was held in a lighter breeze which diminished as the race went on, spreading out the competitors wildly. 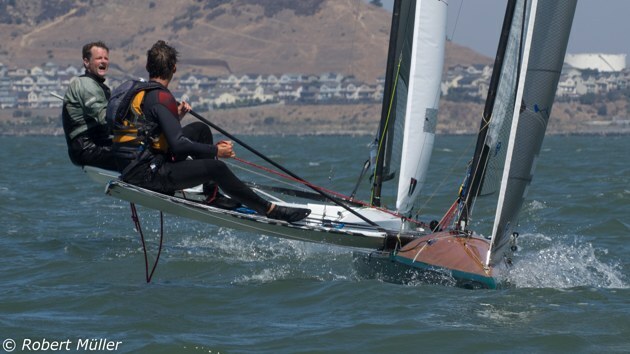 Race 4 was held in a dying breeze, with numerous place changes due to the vagrancies of wind and direction. The last run was almost windless, and was extremely hard going, followed by a short beat to the line in which we must have averaged about 0.2 knots� In the ICs, Colin won followed by Alistair. Tony Robertshaw broke the dominance of Robin in the AC fleet. At this point we were due for a third race, but although a bit of breeze filled in it was never very satisfactory in strength and direction. The RO's decision to throw up AP and C and retreat to the clubhouse for a late lunch was, I think, universally approved. After lunch we went out again and milled about for three quarters of an hour or so, but the wind never really co-operated, and in the end a halt was called. Amazingly enough the breeze didn't even fill in after racing was abandoned for the day. Rain. Wet, wet wet. Weren't they a Scots band? The morning was damp, wet, miserable, and naff all wind. Even from the breakfast room of my B&B it seemed clear to the two competitors there that the AP was going to be the flag of the day. Supposedly, from conversation in the clubhouse, it was blowing 30 knots on the Isle of Arran 50 miles to the southwest. It wasn't at Loch Lomond. After about two and a half hours of a sodden red and white flag hanging limply from the flagpole a bit of breeze started to put in an appearance, and the drizzle subsided so the AP went down and it was time to get going. At this stage there was a distinctly foreboding feeling about the breeze: it had that feeling of a front coming in that was going to blow and blow stronger and stronger. 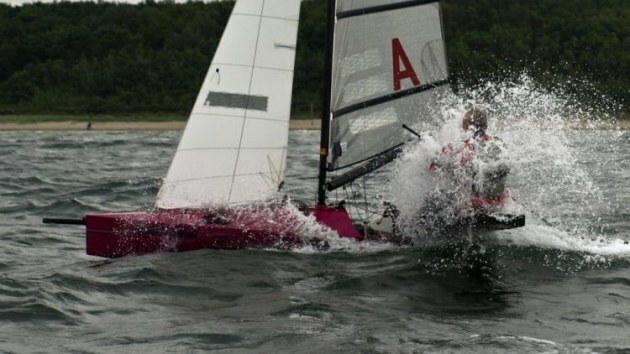 There were one or two jitters on the beach and even the odd heavy weather sail coming out. So we all sailed out, and it was a perfectly sane, but robust Force 3. Rather a decent canoe breeze, and we had a fair old blast about whilst the RC set a course for race Five. Two decent laps, albeit with the wind somewhat diminishing, and a very quiet last reach of a second triangle. The wind filled in a bit again, and we started a second race. A decent first beat, a reasonable first leg of a triangle, and then the wind switched off pretty much completely. I suppose the leg must have taken a good half an hour, although a little bit of air came in at the end to get us back to the line and a welcome S flag. Robin and Arne won races 5 and 6 in the AC fleet, and Alistair and Colin the IC fleet races. The sun came out to play... and so did the wind! True to form,the Scottish weather provided the contrasts we had become used to throughout the Championships. With 25 knots over the racecourse, with gusts of 28, the fleet were kept ashore by the OD. Both Paul Hignett and Alistar Warren went out for a yacht and both demonstrated that it would need a signficant sized party of helpers allocated to each boat to get safely off the beach. 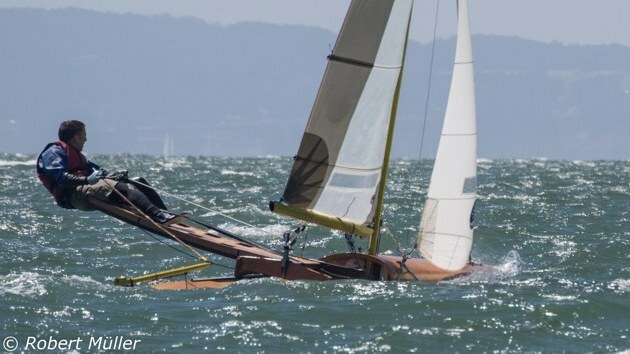 Consequently, and even if the conditions out on the water had been anything other than extremely marginal, there was simply no way to get a fleet off the beach. By 2 o'clock it was obvious that the wind had increased. with a forecast to increase even more, the last three races were abandoned. Congratulations to Colin Brown and Robin Wood, IC and AC champions respectively. 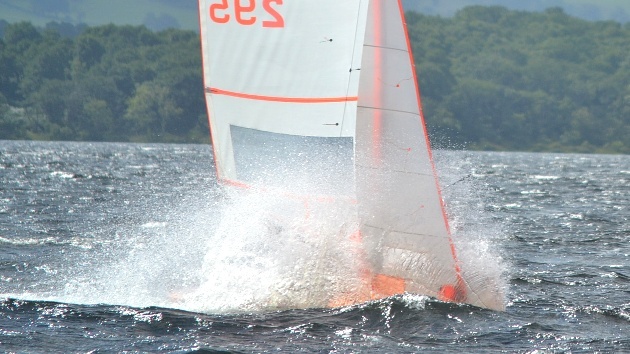 The fleet would like to thank everyone at Loch Lomond Sailing Club who made the event a success,with a special mention to Fergus Duncanson (OD) and Crawford Mac Calman (commodore) for exceptionally well run races and organisation throughout the week.